for hikers, bikers and other summer guests. In the former ' Grange ', a fascinating and spacious place (45 sq.m.) 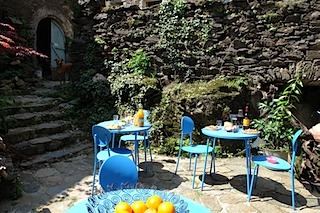 with centuries-old walls of flintstone, a unique stop-over (gîte d 'étape) has been created. The interior decoration, done by local artists, creates a fascinating atmosphere, both comfortable and private. Two handcrafted four-poster singlebeds with silk coverings adorn the high space. 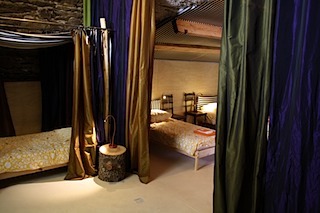 The adjacent room is also tastefully decorated with silk roof coverings, four handcrafted beds and bedside tables. The beds, comfortable and spacious (200 x 90cm), are equipped with a mattress and mattress protection, a pillow and blankets as well as bedside lamp and bedside table. Shower and toilet on the ground floor. Bring your own sleeping bag and pillow case or, if you prefer to travel slightly lighter packed, you can rent sheets, pillowcase and/or towel on the spot. In the ‘hikerslounge’ with its beautiful cross vault, you’ll find a small kitchen unit where you can make a cup of tea or coffee or heat up your soup etc. Also at your disposal: a refrigerator, cooking utensils, crockery and cutlery. There are some hiking maps and other local and tourist information leaflets ready for consultation. The specially designed dining table also invites you to a game of chess or checkers, or you may choose from the other games and books available. WI-FI available in the Mas. Fully regenerated after a good night's sleep you can continue your itinerary via the path that runs alongside the Mas wich joins up with the ' PR of the Vallée du Luech ', the ' GR 68 ' or any of the other hiking routes. On reservation in advance: enjoy a nice and fresh breakfast served, order your picnic to take away or join us for a nice supper at the ‘table d ' hôte’.